Receive the Framework by email. There are many acquisition channels out there. Some you are not using or not using their full potential. Find and prioritise out your acquisition levers. How should I use the BRASS Framework? Find tactics that support your goals. Map your road to growth. Get your amazing team together. Try getting in different profiles to look at tactics and channels from a different perspective. For your preferred channels, find solid actions and rate them on 5 with the BRASS criteria used in the framework. What channels can you use and what will you do with them? Let the book 'traction' inspire you to find new channels. You now have ranked your tactics. Carry out your top channels and acquisition tactics. Inspire business growth. Digital transformation implies future proof customer centric business models.Off-brand testing was the ideal experiment design for new business model validation with results in a fast time period while putting the customer first. Enjoyed working with The Growth Revolution on this in a lean and agile way and appreciated their swift understanding of our business. Rank your acquisition tactics to find out which hold the most importance. Find new use of acquisition channels. There are a lot of acquisition channels, and new channels are created by the day. 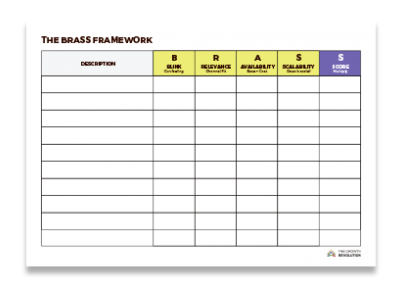 The Brass Framework is a simple 5-step process to prioritise and start testing these new channels. Let’s boost your growth! Find techniques that actually scale your business.